Button and Bead Jewelry is an essential guide to creating stunning, fashionable jewelry. Craft author Deborah Schneebeli-Morrell shows you how by using a wide variety of materials, from chiffon and lace to copper and moonstone, as well as scraps from past projects, you can make any number of contemporary, eye-catching pieces, each with your own unique twist. Whatever your standard, the 25 delightful projects and variations - from a ribbon choker with velvet flowers to linen heart brooches - will help you make the most of your sewing box. Whether you want to make practical, fun, everyday items or intricate, stylish designs, there is a range of projects to suit your tastes. 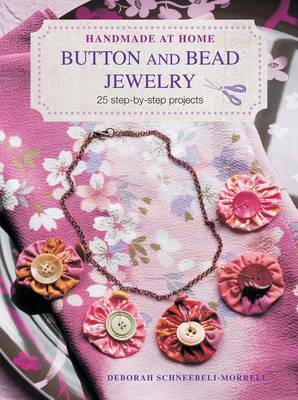 Complete with step-by-step photographs, helpful explanations of techniques and a comprehensive list of materials, Button and Bead Jewelry will help you on your way to creating exquisite pieces in no time.